The next series of Transit satellites were operational prototype satellites. After the launches of the experimental Transit satellites, the Scout-X3 rocket was selected as the dedicated launch vehicle for the program because it delivered a payload into orbit for the lowest cost per pound. However, the Scout-X3 decision imposed two design constraints. 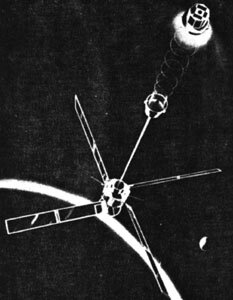 First, the weights of the earlier satellites were about 300 lb each, but the Scout launch capacity to the Transit orbit was about 120 lb (it was later increased significantly). A satellite mass reduction had to be achieved despite a demand for more power than APL had previously designed into a satellite. The second problem concerned the increased vibration that affected the payload during launching because the Scout used solid rocket motors. Thus, electronic equipment that was smaller than before and rugged enough to withstand the increased vibration of launch had to be produced. Meeting the new demands was more difficult than expected, but it was accomplished. The first prototype operational satellite Transit 5A-1 was launched into a polar orbit by a Scout rocket on 18 December 1962. The satellite verified a new technique for deploying the solar panels and for separating from the rocket, but otherwise it was not successful because of trouble with the power system. Transit 5A-2, launched on 5 April 1963, failed to achieve orbit. Transit 5A-3, with a redesigned power supply, was launched on 15 June 1963. A malfunction of the memory occurred during powered flight that kept it from accepting and storing the navigation message, and the oscillator stability was degraded during launch. Thus, 5A-3 could not be used for navigation. However, this satellite was the first to achieve gravity-gradient stabilization, and its other subsystems performed well.